INDIANAPOLIS – For the third year, the Indianapolis Colts presented the PLAY 60 Fitness Grant program. As a part of the NFL’s PLAY 60 initiative, schools and non-profit organizations were invited to apply for individual grants from the Colts, up to $2,000 each, to facilitate youth fitness programs and events in their community. The Colts have selected five local non-profit organizations to receive funding to support physical and nutrition-related activities, from neighborhood sports teams to outdoor recreation and health education programs. The PLAY 60 initiative is an NFL-wide effort to encourage youth to participate in at least sixty minutes of physical activity each day. For more information about Colts PLAY 60 programs, please visit www.colts.com/PLAY60. For this week, the players have returned to the Indiana Farm Bureau Football Center for the start of the offseason program. What are your thoughts on the players ramping up the 2014 offseason? What areas of concern do you still have with the draft two weeks away? INDIANAPOLIS – This Mother’s Day, the Indianapolis Colts mascot, Blue, is teaming up with Meijer to offer fans a unique gift for the special mom in their life. Through a personalized surprise visit from Blue that includes confetti, flowers, chocolates, and a card, individuals can give their mother a day they will remember forever. Whether it’s an office, school, or home, let Blue surprise your mom and shower her with gifts. Blue’s Mother’s Day Visits are currently available May 7-9. Individuals who are interested in booking Blue for Mother’s Day this year can visit www.colts.com/blue and submit a request online or call 317-808-5264. WHEN: Reservation being accepted online for deliveries on May 7, 8, and 9. The Indianapolis Colts today announced that restricted free agent cornerback Josh Gordy has signed his qualifying offer. Gordy appeared in 12 games in 2013 and registered nine tackles (eight solo), three passes defensed, one interception and four special teams stops. He competed in both postseason games and totaled eight tackles (seven solo) and one pass defensed. Gordy’s interception came in Week 4 at Jacksonville where he was part of a defense that limited the Jaguars to 165 net passing yards. For his career, Gordy has tallied 77 tackles (56 solo), eight passes defensed, four interceptions, 1.0 sack, one fumble recovery and nine special teams tackles in 43 games played (10 starts). In three postseason games, he has notched eight tackles, one pass defensed and one special teams stop. The Colts also placed center Phil Costa on the Reserve/Retired list. The Indianapolis Colts today announced dates and times for its 2014 preseason schedule. The Colts will open the preseason with a Week 1 road contest at the New York Jets on Thursday, August 7 at 7 p.m. The meeting is only the second between the two teams in preseason play as the Jets claimed a 2004 victory, 31-7, at the RCA Dome. The New York Giants will travel to Lucas Oil Stadium for a Week 2 contest on Saturday, August 16 at 7 p.m. The Colts and Giants will compete for the second consecutive year in the preseason, following Indianapolis’ 20-12 win at MetLife Stadium in 2013. Overall, the Colts hold an 8-5 all-time preseason record against New York. Indianapolis will host the New Orleans Saints on a nationally televised (CBS) broadcast on Saturday, August 23 at 8 p.m. It will be the first preseason meeting between the two teams since a 2006 matchup in Jackson, Mississippi. The Colts hold a 7-5 preseason advantage in a series that dates back to 1975. Dating back to 2001, the Colts and Cincinnati Bengals have met each preseason, traditionally in the finale. 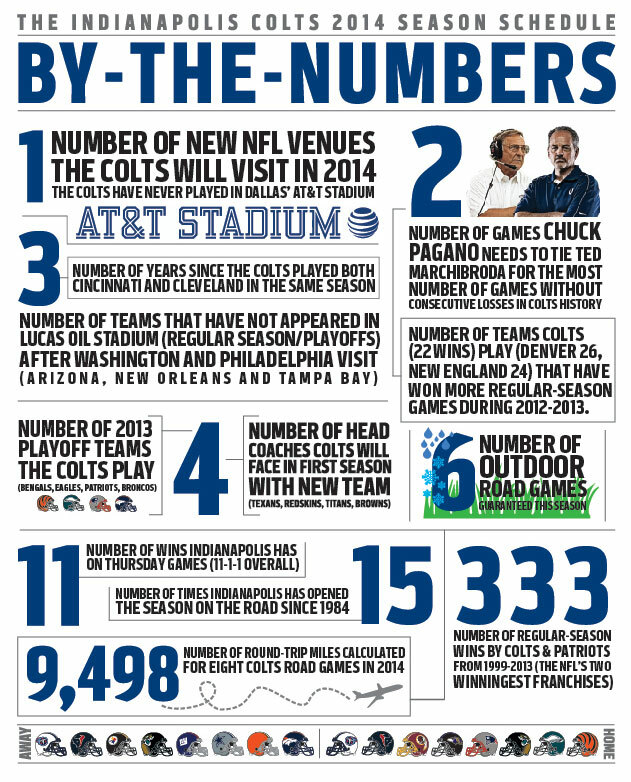 This season, Indianapolis will travel to Cincinnati (Thursday, August 28 at 7 p.m.) for the second consecutive year as the Colts look to win their third preseason contest in the last four years. Overall, the Bengals hold a 14-8 preseason series record, which includes a 27-10 win last season. Thurs., August 7 at New York Jets 7 p.m. Sat., August 16 NEW YORK GIANTS 7 p.m. Thurs., August 28 at Cincinnati 7 p.m. The Indianapolis Colts today signed free agent fullbacks Stephen Campbell and Cameron White. Campbell, 6-1, 245 pounds, attended the 2014 New York/New Jersey NFL Regional Combine as well as the Super Regional Combine at Ford Field in Detroit. In 32 career games for the West Virginia Wesleyan Bobcats (2009-2012), he totaled 65 receptions for 625 yards and eight touchdowns. As a junior in 2011, Campbell earned honorable mention West Virginia Intercollegiate Athletic Conference (WVIAC) accolades after starting all 11 games and catching 38 passes for 303 yards and five touchdowns. In 2010, he appeared in all 11 games and recorded 14 receptions for 151 yards and two touchdowns. White, 6-2, 251 pounds, attended the 2014 Chicago NFL Regional Combine in addition to the Super Regional Combine in Detroit. In four seasons (2009-2012) with the Hillsdale College (Mich.) Chargers, he registered 94 receptions for 1,145 yards and 12 touchdowns. He also scored one rushing touchdown and contributed with 17 tackles on special teams. As a senior in 2012, White started eight games and caught 38 passes for 443 yards and five touchdowns. He earned All-Great Lakes Intercollegiate Athletic Conference (GLIAC) first-team honors as a junior after posting 32 receptions for 372 yards, four touchdowns and one rushing touchdown.